Our Delicate Oat range for sensitive scalp and fragile hair. Nourishes fragile hair and soothes sensitive scalp. Hair is enveloped in protective care without being weighed down. Enriched with natural ingredients extracts: Rice Cream & Oat Milk. Vegan formula: No animal derived ingredients or by products. 100% recyclable bottles. Garnier Ultimate Blends Delicate Oat hair care range for a sensitive scalp and fragile hair. - Delicate Oat: Our ultimate scalp and hair care products blended with oat milk and rice cream for naturally beautiful hair. Hair Benefits: With a light, creamy formula and delicate fragrance, our Delicate Oat sensitive scalp and hair care products calms the sensation of a sensitive scalp and reduces the feeling of itchiness. Find comfort for the most sensitive of scalps with our Garnier Ultimate Blends Delicate Oat hair care products for a sensitive scalp and fragile hair. Rice cream, famous for its softening properties and oat milk, a known soothing ingredient, are blended with love. When incorporated into your hair care routine, the delicately scented, deeply comforting scalp and hair treatments calm the feeling of itchiness and nourish fragile hair, leaving it feeling blissfully soft. 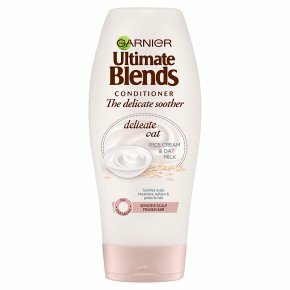 Extra Gentle Formulas: Garnier Ultimate Blends Delicate Oat combines well known trusted ingredients to complement each other. These ingredients provide ultra-gentle formulas to look after your scalp and hair. Tested under dermatological control. Discover Delicate Oat's naturally derived ingredients: Inspired by the skincare practices of eastern women, rice cream in Delicate Oat harnesses the natural goodness of rice, which is rich in vitamin E and vitamin B complexes. This accompanies the oat milk - a time - honoured beauty ingredient rich in vitamin B1, calcium and iron. How to Apply Garnier Ultimate Blends Delicate Oat Conditioner: Smooth generously into wet hair and rinse thoroughly. Use after our Delicate Oat Sensitive Scalp Shampoo. For intense care, indulge in our Delicate Oat Hair Treatment. Finish with our multi-tasking Heat Protection Milk to help protect hair whilst styling. In case of contact with eyes, rinse them immediately. Do not ingest. Keep out of reach of children.